A patent application filed by Ford describes a Cooperatively Managed Merge and Pass (CMMP) system that would allow drivers needing to travel quickly to use less congested lanes, and travel more freely, by paying other drivers in cryptocurrency. Other road users would move to slower moving lanes and allow a paying driver to merge or pass. Primarily, the patent, filed on September 16th, 2016, describes a system for “vehicle-to-vehicle cooperation to marshal traffic” whereby compatible vehicles communicate electronically to identify traffic “cataracts”. The “cooperative adaptive cruise control module”, once it has identified a traffic issue, can then coordinate with other cooperative vehicles to form a “platoon” which moves at a constant speed to effectively navigate the traffic cataract or congestion. Compatible vehicles would be equipped with a “vehicle-to-vehicle communication module” and a “cooperative adaptive cruise control module”. In Ford’s proposed system, when a traffic cataract is identified, priority switches from individual travel time preferences to a group flow rate through the traffic cataract. There is, understandably, no indication of whether Ford’s ideas could come to fruition, but Ford does also refer to “standard vehicles” with no communications systems, being “marshalled” by “cooperative vehicles”. The patent also details an example system called CMMP, where cooperative “merchant” vehicles would receive a payment in units of cryptocurrency, or “CMMP tokens”, from “consumer vehicles” to allow the consumer vehicles to merge, pass, and have priority in faster moving lanes of traffic to reach their destination quicker. The CMMP system could allow the “consumer” vehicle a certain amount of priority time based on how many CMMP tokens are spent. The full patent, filed with the United States Patent and Trademark Office (USPTO), goes into more detail about Ford’s proposed ideas and how they could, in theory, work. 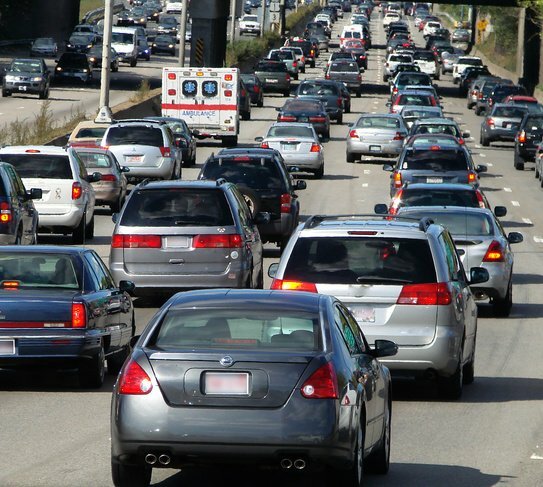 How far off do you think “platoons” of connected vehicles navigating traffic congestion are? Would you pay other drivers for freedom of the fast lane?